I blogged a few months ago that we ( a group of designers and myself) were in negotiations for a license, and then I became quiet, well I became quiet because it never came through, which happens. 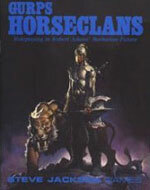 The license was for Robert Adam's Horseclans, it is a science fiction series by Robert Adams, set in a North America that had been thrown back to a medieval level by a full-scale nuclear war. I loved this series as a youth, and loved the art of Ken Kelly on the covers, but alas it was not meant to be. The last game supplement for it was for GURPS and has been OOP for a long time. It would of been for Savage Worlds.